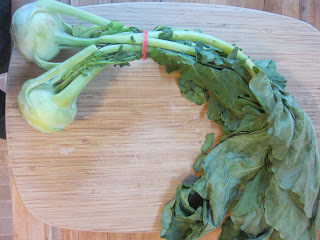 Kohlrabi is one of those veggies that makes people anxious. It's weird looking. It's not one of the ten vegetables* I grew up with. It's actually pretty easy to just peel it and throw it in a salad. It's sort of like a mild radish, or a bland, crisp apple. 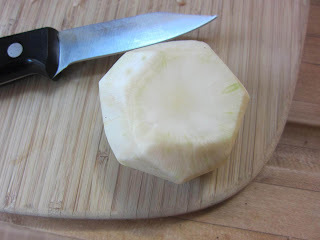 So when we got the kohlrabi in our CSA haul, the first bulb was eaten raw, off the cutting board, while we prepped other veg. It didn't even make it into a salad. 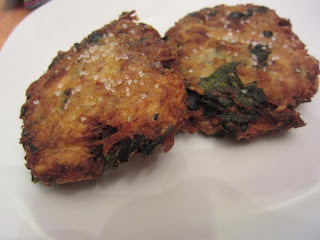 You can use the greens, just pretend they're collards and you're all set. 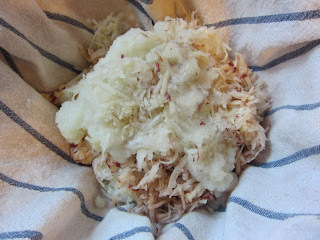 But one quick answer for dealing with unusual veg is to shred and crisp. We've done this with parsnips, we can do it with kohlrabi. 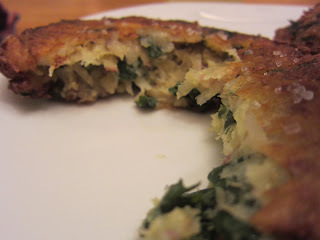 Enter the potato pancake.First I got those greens going in a pan just with some water. If I had a microwave, I'd "steam" them in there, but you're just looking to soften them a bit. Pay no attention to them, and go about the rest of your cooking. I shredded three small red potatoes, from Week 4 of the CSA. Skin and all, just be sure to scrub. Then I shredded up two kohlrabi bulbs right in there with it. 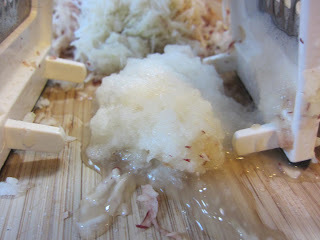 I shredded a whole onion as well, which produced onion snow. I also shredded a garlic clove. I spooned all of the shredded veg into a tea towel, wrapped it up tightly and drained it over the sink like it was homemade ricotta. Then I remembered the greens and added them in as well. You want this dry, so you wring and squeeze, wring and squeeze, shuffle around and wring again. So for about three cups of shredded veg (pre-squeeze) I added three beaten eggs and three tablespoons of rice flour. Rice flour makes things crispier than wheat flour. 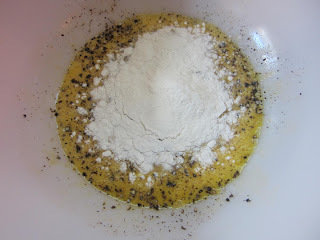 If I didn't have rice flour, I might use two tablespoons of all purpose flour and a tablespoon of corn starch. Also some salt and pepper, maybe a quarter teaspoon each. More salt later. 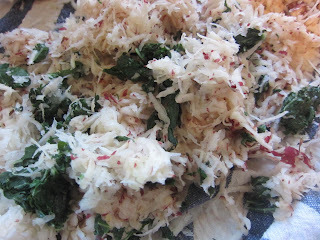 I worked the flour and eggs into the shredded veg with my hands--no photos, but it was as unattractive as you might imagine. Then I formed the mixture into balls, bigger than a golf ball, smaller than a tennis ball. If they didn't hold their shape, I'd add more flour, but we were all set. 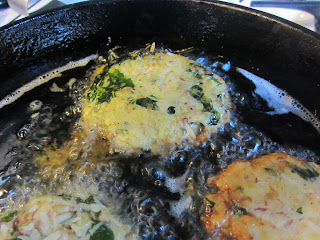 I heated less than a quarter inch of oil in a skillet and when it snapped when hit with a drop of water, it was ready for a drop of kohlrabi potato pancake. It's safer and more reasonable to just put the tip of a wooden spoon or chopstick in there and look to see if the oil bubbles around the edges of the wood, but hey, water's fun too. I slowly lowered one ball in, knowing the fun of having hot oil snap back onto my forearm, and smushed it down a bit with a spatula. Once I saw that the oil was hot enough, as in there were tiny bubbles all around the edges of the pancake, I added another and smushed it as well. I also turned the oven on to warmish, so that I could stash mid-batch pancakes in there while I made more. Also, you can see some toes down there. Wear socks when you fry. When they were golden around the edges, like the guy in the bottom right here, I flipped them. I actually flipped each pancake four times: once when they were just getting golden, once when the other side caught up, then again to crisp the entire exterior of side one and again for side two. I'm an anxious fryer. Maybe two minutes per flip, for a total of four minutes per side? The color and crispiness should be your measurement. Once they're golden brown all over, remove to a paper towel, or if you're more on top of your laundry than I am, move them to a regular kitchen towel. We have good days and bad days. Hit them with a sprinkle of kosher salt while they're hot and slightly damp from the oil, so the salt sticks. The into the oven (sans towel) to wait. 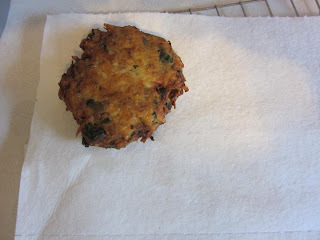 When I made potato pancakes, or fritters, or anything else like this, I make extra to freeze. It's not every day I'm willing to fry my forearms and toes, so reheating last week's (ok, month's) fritters or pancakes is a welcome break. 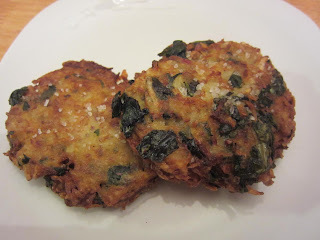 They're all golden and crispy, but on the inside they're almost creamy, with exciting bits of greens. Two of these and a salad and you might not quite hate yourself over it. One is a decent appetizer. Add sour cream, if you're like that. *Alphabetically: broccoli, carrots, celery, corn, cucumbers, green beans, lettuce, peas, potatoes, spinach. 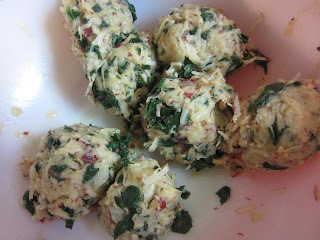 This recipe is cross-posted at Saturday’s Mouse, where I’m working on making food out of food. 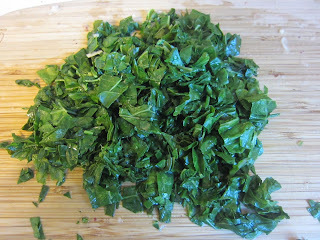 Chop greens and simmer in some water, or microwave-steam, just to soften a bit, while you're doing other things. 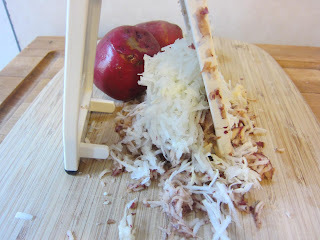 Peel kohlrabi, and shred along with potatoes (with skin), onion and garlic. Drain greens and add to other veg in a pile in a tea towel. Squeeze and drain, quite a bit, to get them as dry as possible. Mix three eggs and three tablespoons of rice flour (or sub 2 tbsp AP and 1 tbsp corn starch) with half a teaspoon each salt and pepper. Reserve remaining salt for later. Mix this in with the drained shredded veg mix. Form into small balls (bigger than golf, smaller than tennis). Heat oil in a skillet - less than a quarter inch of oil, until it spits at you when you hit it with a drop of water, or bubbles around the edges of a wooden spoon or chopstick. 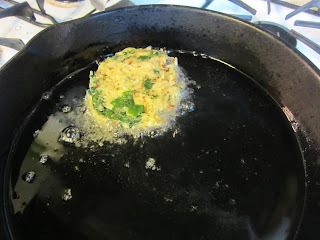 Add a veg ball to the hot oil and squish with a spatula until it's about a half-inch thick. If the oil bubbles all around the edges, you're set, add another and squish. Fry until golden brown on both sides, maybe four minutes total per side, but until done. Drain on a towel, sprinkle with additional salt and keep warm in the oven until serving time. Makes 8 pancakes, and they freeze very well.